This time around our recipe swap theme was one of my favorites…burgers (and sandwiches, too). Frank just isn’t a big fan of burgers for dinner at home, or even when we’re out. I mean, don’t get me wrong…he’ll eat them 🙂 but it would just never be his first choice. So, I made this for myself for lunch while he was at work. Thanks for a great recipe, Stef! Combine breadcrumbs, juice and soy sauce in a bowl and mix. Add meat and mix well. Shape into 4 patties. Grill for about 10-12 minutes, brushing occasionally with teriyaki sauce. With a few minutes left, add pineapple to grill and cook for a minute or two on each side. Baste with sauce if you like. 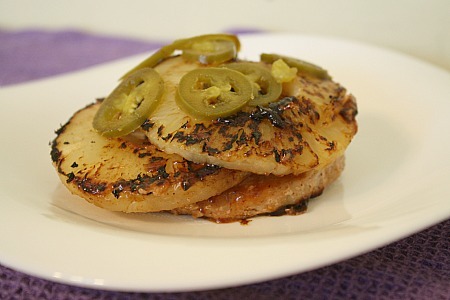 Plate burger and top with pineapple and jalapeno. This entry was posted in burgers, fruit, main dishes, QuickAndEasy, sandwiches, turkey. Bookmark the permalink. It’s hard to make turkey burgers taste good but you’ve definitely done it with these! Yum! Looks great. I do loved grilled chicken/turkey with pineapple.